The future is full of opportunities to make great strides in CX and business value. Break open the fortune cookie. Shine the crystal ball. Dust off the tarot cards. We’re taking a look into the future of customer experience with the experts who live and breathe it every day with brands and consumers. Leaders from TTEC Digital’s consulting practices—Strategy & Operations, Data Insights, and Learning & Performance, recently sat down for a conversation on the state of customer experience now, and what the future holds for companies and customers. From frictionless interactions to employee empowerment, they shared their insight for what’s to come in the field of customer engagement. What are some components of a great customer experience that you see companies are doing, or that you wish companies would do? Larry Mead: The same things we talked about 10 years or 15 years ago are still the same ones now. People want contextualized experiences. Companies should know exactly who I am, where I came from, what my last interaction was. They should know my value, know me. And then you’ve got this whole theme around frictionless. It’s got to be easy to do business. It’s got to be engaging. It’s got to be trustable. And I think it’s all going to be exactly the same in the future. But for larger companies who have fairly complex ecosystems, I think it may be 15 years of operationalizing these concepts. Paul Ignasinski: I think that’s spot on. I kept thinking about this question and it just seems like all those things around personalization, frictionless—all the buzz words will still be there. It continues to shift a little bit into what the reality is, especially with different experiences across different retailers, service providers, etc. The bar keeps moving in terms of what those things actually mean and how they come to life. It’s hard to bring them to life. What are the challenges you’re seeing from companies as they try to innovate their customer experience? Ignasinski: In the area of personalization, for instance, it can get creepy. Look no further than the Cambridge Analytica stuff, or with virtual assistants. People are asking, “Is Alexa listening to me all the time?” I think we’re getting to the point where companies are going to have to find that middle ground between the human and the machine to make it not seem creepy. Marcy Riordan: Building off that, another challenge today, and it will probably continue in the future, is that there’s so much data. There’s investment in collecting the data, but still a real challenge is around what data is actually useful. And so the more data that’s created, it sometimes creates more questions. Where should companies invest and what’s not worth it? The stuff that’s being collected and the different ways that companies are looking at new and novel things is unbelievable. So that’s going to be a big learning process. I think as we go forward, companies will need to determine what the ROI is on all that effort. Ignasinski: Also, CX is interesting because it’s an umbrella over so many largely lagging indicators, things like NPS and CSAT. These metrics, once you measure them, give you reason to commit to the things that you know will drive them. This challenge is that those things cost money, and oftentimes with constrained budgets and lagging indicators, it’s hard to build a solid business case. As a result, CFO approval on initiatives becomes tougher. So probably the biggest challenge is being able to tell that story and truly continue to hammer the point of ROI outcomes to really enable strong CX. The companies that do it well are seeing it, but the ones that are further away and not investing are getting in some trouble and are having a hard time telling that story. How does the employee experience connect to the customer experience, and how do you see it evolving in the next few years? Lamont Exeter: The line between employee and customer is rapidly eroding. The way employers treat their employees is transforming to the way employees treat customers. And because the world is so connected, ill-treated employees are speaking up and companies are feeling the financial ramifications. Employees may bad-mouth the company publicly, or worse. With unemployment so low, many will simply leave, which will cost the company time, resources, and money to replace them. But the good news is that the inverse is true. When employees love their company, they promote it and those brands are gaining marketing momentum. Matt Baker: From the EX side, companies should enable employees to be brand advocates (and engaged) for their company, to be active change agents within their organization (have a voice, bring forward positive change) and to ultimately enable them to effectively produce the expected outcomes of their role as well as prepare them for the next step in their career. This is mission critical in today’s world and oftentimes cited as the number one reason for why employees leave organizations. 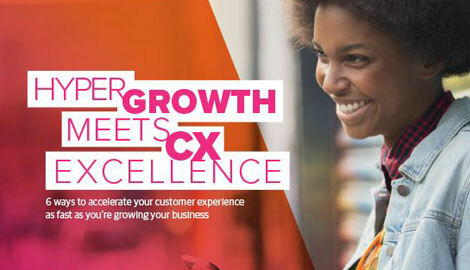 From the CX side the front-line performer is the critical linchpin in driving exemplary CX. If employees are not equipped, competent, engaged, and empathetic, then the end result will be a poor customer experience. Lastly, today’s customer has a strong marketplace voice (more so now than any time in history), they are quick to change brands, and will proactively voice concerns/issues as they interact with employees, spreading faster and farther than ever before. So equipping and engaging the employee base to truly be brand ambassadors is essential to delivering on the brand promise. What about B2B customer experience? Mead: Customer experience is moving further up the value chain, so the business-to-business experience is going to become really critical. Yet a barrier right now is most B2B businesses are not thinking much about the impact on the end customer of their services. I think that awareness will grow as the business value of doing all these things we’ve talked about takes hold. And as the technology starts to get in place to drive more transparency through a value chain, people can see how they’re directly impacting the customer, be measured, and held accountable. It’s a barrier today. It’s just now beginning to get tapped, and will only improve in the future. Research from Forrester and others has found that the customer experience has stagnated or fallen recently. To what do you attribute this step backwards, and how can firms get back on track? Baker: Organizations that do not focus on CX are dying or folding. Retailers or anyone providing a product or service in today’s world is focusing on optimizing the client experience. We are now in a position where it is “adapt or die.” If organizations are not focusing on providing a better customer experience, they run significant viability risks long term. With that said, many organizations still are struggling with this. In my opinion this is where the value of a data-driven culture becomes critical. Organizations need to “measure what matters” and enable them to prioritize their focus on critical tasks versus trying to tackle everything, which many companies try to do and fail. Exeter: I think that we as companies, as organizations, or as people sometimes even management, we get in the way of it. Stop and look at younger companies that don’t have their bureaucracy and see how often they get it right. So, at what point does doing the right thing conflict with either your shareholder values or your historic and antiquated way of doing things? People talk about wanting to change, but they don’t really want to change. Oftentimes, the problem is we’re not willing to do it because it may affect us. How can brands best prepare to meet unanticipated customer needs that will arise in the near future? Mead: I, like nearly all consumers, expect information to transport across channels. Companies must get the omnichannel customer journey right. It is another disruptive trend that raises the bar on expectations for what a great experience looks like. Exeter: Listen! Also discussed previously, give your employees (who are your customers) the ability to voice their feedback. The good. The bad. The ugly. Listen without bias and take it in. Do this via open social platforms instead of old-school town halls or focus groups. Encourage employees to challenge the status quo. Reward it. This is real-time, immediate feedback versus research studies which are, by their nature, months old. Baker: The best suggestions typically come from customers and employees. Create established and governed two-way communication channels (for customers and employees) to gather, receive, collate, and take action on inputs and feedback to ultimately enable organizations to optimize current models, identify where future opportunities are, etc., is mission critical to understand what is actually happening in the field and at the customer interaction points. The last critical element is having resources that are dedicated and positioned to act on this feedback. Many organizations today still struggle with acting on feedback until an issue becomes mission critical (in many cases employees/clients state they have been saying this ‘for years’ and ‘no one listened’). What are you most excited about the future of the customer experience, from a professional perspective and a consumer perspective? Mead: This is not a fad that’s going away. There’s all this disruption going on because there are all kinds of tools to help companies do different things to meet evolving customer needs. Riordan: If companies deliver on their promises and experiences do become frictionless and eliminate the frustration that you have right now when calling customer service, it will be a bright future. So, fast forward four to five years where friction is taken away, that would be a pretty good thing. I’d be excited for that. Why should consumers have hope that experiences will improve in the next five to 10 years? Mead: One thing we lose sight of in this topic, is how much experiences improve naturally as the cost to provide better experiences gets more cost effective. Technology and information availability generally fuels the cost effectiveness of services. For example, for most of us the experience we have in driving our car today is much better than it was 10 to 15 years ago—Bluetooth, rear-view camera, navigation—many things are standard now. It’s become the norm, and the trend will only continue. Another key is that consumers have a massive voice in articulating their experience and influencing brand perception. Lastly, there is a growing awareness of the value that a poor or good customer experience and product experience has on profitability. As Big Data allows a better understanding of the individual consumer value, cost to acquire and serve, brands will get smarter about how they invest in the customer experience. Exeter: Because companies do not know who their future competition will be, they cannot buy them out or crush them. How many healthcare companies thought Apple would be their competitor? While TV companies were looking out for satellite providers, online streaming stole their business. Insurance companies are trying to contain the threat of car sharing as fewer people are driving. Did taxi drivers ever think they would fall victim to a mobile app? Smart companies are focused on ensuring their customers love them so when the unknown competitor comes, they have brand loyalty.